Hi, my name is Sim and I am responsible for on-boarding new customers. If you produce garments using our fabrics and you have tech packs then contact me via our contact page and I will review and feedback within 48 hours. Chris is our marketing manager. If I am too busy or we realize that we can't serve you, then he will reach out to you. Allow me to introduce the factory my parents started 20 years ago. My parents first started producing cut and sew knitwear when I was in High School. I joined them in 1993 and started developing relations with customers overseas. Decades later we have experience exporting to USA, UK, France, Belgium, Poland, Australia and Russia. Our factory has steadily grown from doing CMT only with 2 sewing lines to doing FOB and LDP with 17 sewing lines. We have faced many problems and solved them all when it comes to producing cut and sew knit garments in Vietnam. We produce men's, women's and children's clothing using circular knitted fabrics. We buy cotton, polyester, viscose, modal and spandex yarn. We import the yarn into Vietnam and then outsource the knitting. We produce a variety of fabrics from basic jersey fabric to complicated jacquard fabric. We then outsource the fabric dyeing to our trusted Oeko-Tex certified partners who will dye to your Pantone color and finish the fabric according to your technical specifications. We check fabric and cut it before sending it to our 17 sewing lines for seaming and embellishment. We also source trims and accessories from Vietnam, China, Taiwan, Indonesia and Korea. We iron and pack under our roof. We have our own in-house quality control and welcome third party inspectors likes SGS, TUV and Intertek. After packing in poly bags and carton boxes, we deliver your finished garments to the Ho Chi Minh city port where your freight forwarder manages shipping. We are a family owned private clothing manufacturer with two factories and one merchandising office. Our first factory is now rebuilt into our headquarters. Our headquarters is located downtown Ho Chi Minh City and contains our merchandising office, pattern and marker team, sample lines, logistics and accounting department. Our 2nd factory is located 30 minutes from Ho Chi Minh City and currently has 6 sewing lines. Our 3rd factory is located 2.5 hours outside of Ho Chi Minh City and currently has 11 sewing lines. Read below to learn about our MOQ, payment terms and lead times. We produce men's, women's and children's clothing using circular knitted fabrics. We buy cotton, polyester, viscose, modal and spandex yarn. We import the yarn into Vietnam and then outsource the knitting. We produce a variety of fabrics from basic jersey fabric to complicated jacquard fabric. We then outsource the fabric dyeing to our trusted Oeko-Tex certified partners who will dye to your Pantone color and finish the fabric according to your technical specifications. We check fabric and cut it before sending it to our 17 sewing lines for seaming and embellishment. We also source trims and accessories from Vietnam, China, Taiwan, Indonesia and Korea. We iron and pack under our roof. We have our own in-house quality control and welcome third party inspectors likes SGS, TUV and Intertek. After packing in poly bags and carton boxes, we deliver your finished garments to the Ho Chi Minh city port where your freight forwarder manages shipping. We also want to answer all your questions before you send us your tech pack and order quantities. Scroll down and you will see lots of pictures of the types of clothing we specialize in. We don’t make woven garments like suits, dress shirts, swimsuits or lingerie. We specialize in embellished and fashionable styles for men, women and children. We have flat lock machines if you need yoga workout clothes or cycling jerseys. Leggings, for example, is a style we've done a lot of in 2017/18. Our sweet spot is women's dresses using circular knit fabrics. Our MOQ is 2,000 pieces per style. This is assuming that the fabric consumption is the same as a t-shirt. If the garment style is a full length dress the MOQ is lower - like 500 - because the fabric consumption is higher. If the garment style is a sports bra then the MOQ is higher - like 1,800 - because the fabric consumption is lower. Our main constraint is the fabric MOQ imposed on us by our fabric suppliers which is 1,000 meters per color. In 2008 we started to develop our own fabric as opposed to buying all our fabric from China like most Vietnamese clothing manufacturers. We went to India to meet with cotton growers and started importing cotton into Vietnam. Then we developed relationships with knitting and dyeing houses in Ho Chi Minh city. Today we produce over 200 tons per month of circular knitted fabrics for our customers. To produce more is just a matter of making some phone calls and QC ing the production. Our goal is to sell fabric wholesale but we still struggle to keep up with our own demand. ODM stands for original design manufacturer and implies that we design for you as well as produce. There are two kinds of ODM. One kind is where you give us direction, colors, concept ideas and we design a collection for you. The other kind of ODM is where we design according to our own design concepts and if you like our styles you buy them. While we are very good at modifying designs to lower costs without sacrificing quality we are not strong at designing from scratch. We get asked for a catalogue of styles to choose from but at this time we don't have one. We can help you quality for lower import duties. We are very good at understanding rules of origin and qualifying for free trade agreement tariff reductions. We have a lot of experience exporting to Russia duty free and we are currently schooling ourselves about CPTPP. If you need help checking your HS-Code we can help you in some cases or we can refer you to our trusted custom broker friends. When it comes to payment terms we require a deposit and shy away from L/Cs. Our production lead time is 60 to 120 days from pre-production sample approval and confirmation of order. We don't sell stock garments so please don't ask us about stock. Please don't just show up at our office. Make an appointment in advance so we can arrange for transportation and make sure our key staff are free to receive you. For more information please contact us via our contact page. One of the most common questions we get asked is about minimum wage. Vietnamese minimum wage is set up by region as you can see below. Keep in mind that we can't pay minimum wage and keep our best staff. There is what we call market wage which is higher than minimum wage. Right now sewing workers with experience are commanding $250 to $300 per month plus we pay them a bonus if they hit productivity targets. Also, we pay workers social insurance, medical insurance and unemployment insurance. At the end of the year, it's tradition that workers get a 13 month salary. When you add it all up, wages in Vietnam are more than minimum wage. When you calculate the price you think a garment should be, use $300/month to be realistic. Our head office is in region I. Our factories is in region II and IV. There are three questions we will ask you and if you answer no to any of them then we can not help you. 1. Do you have complete professional tech packs? 2. Can you meet our minimum fabric order quantity of 1,000 meters per color? 3. Do you have cash to put down a 40% deposit? Fifteen years ago when we were first starting we were much more flexible and did many orders with quantities as low as 50 pieces but now that we have grown and have 900 workers we need a more stable supply of orders which means higher quantities. Have you ever run a sewing factory? There are so many variables that can go wrong that it's quite easy to find oneself in an upside down position - losing money. The same amount of time goes into developing a new style for 50 pieces as compared to 5,000 pieces but the net profit is significantly less for 50 pieces. Our marketing manager, Chris, can help you. He is very well connected and knows many smaller sewing factories but the risk is very high because all small factories aspire to be big and it's just a matter of time before drop small orders for bigger ones. Chris will explain. Please read his advice below. I have one offer for you, if you are willing to put down $US5,000 then we will help you for a month to develop 3 styles using our available fabrics. We are very good at sourcing locally but it takes a lot of our time which is valuable. The $5,000 is not refundable and we can't guarantee success but we will try our best. We won't take your money unless we are confident we deliver according to your written expectations. Also, if you'd like to spend time with me and get my best advice based on manufacturing apparel for 15 + years I charge $100/hour. Contact Chris and he will schedule the appointment to meet me. -Sim, Vice Director, Thai Son S.P Co., Ltd.
1. Hire a professional tech pack freelancer to create your tech pack(s). 2. List out your order quantities in an excel sheet. Show styles per fabric per color per size. 3. Email your tech pack and order quantities to at least three factories and follow up aggressively. All the big names like Mango, Zara and Forever 21 use tech packs when producing garments in foreign countries - it is an industry standard practice. A tech pack is a technical document that describes all the details of your garment. You will spend at least $500 per tech pack, but in the end, you will save $1,000s. Half the battle of creating a tech pack is knowing what you want. Most people who say they don't have tech packs, in fact, don't know what they want, they don't know all the exact technical specifications for fabric, trims, accessories and stitching. To create a tech pack correctly requires training and experience in garment technology. Designers, merchandisers and sewing technicians go to technical colleges and universities to learn pattern making, fabric knitting, sewing technology etc. To think you can create your tech pack by studying what's on the web won't cut it. Factory owners care more about the big picture. They want to know how much business you are bring to the table. They want to know how many days you will keep their lines busy. You give them this information by listing out your order quantities. Show the quantities broken down by style, fabric, color and artwork. This is important because the price is based on quantity and factories have minimums they must meet for knitting, weaving, dyeing, printing and embellishing. In other words, their suppliers impose minimums on them. For example, the factory must buy at least 2,000 labels or 5,000 buttons at time to get a cheap price. If the quantities are too low then factories can not buy cheap and can not offer you a low price. The third step is to contact factories. There are three ways to contact factories in Vietnam. You can can find them on websites like Alibaba.com, Globalsources.com, and Foursource.com. 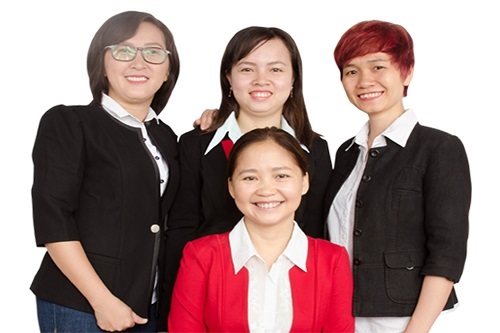 You can contact Vietnamese garment associations like Vitas, Vinatex and Agtek. Or, you can meet factories at trade shows like Sourcing at Magic, Globalsources Fair, or Canton Fair. Once you have the factory contact details, email them your tech pack(s) and preferred purchase order quantities. I recommend you attend trade shows to meet the factories in person. See the samples they have at the show, get an idea on pricing and show them your tech packs to confirm they can produce what you want in the quantities you want. Follow up aggressively with the factories that meet your requirements. Push them to get quotes within two weeks. Compare the prices and customer service levels you get from each factory. Then, when the feeling is right, travel to the factory to see for yourself if they meet your expectations. Work face-to-face with them as they make a counter sample. Negotiate the final price per piece. Be prepared to make a deposit around 40% and approve pre-production samples. Contact Chris for more help. He is your go-to guy if you want to launch your fashion brand and produce in Vietnam. He prepares you to work with factories and introduces you to them.